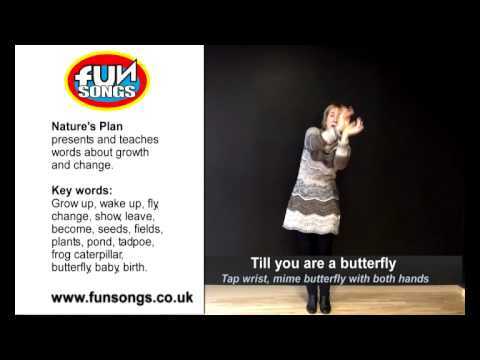 An action song about growth and change in life and nature: seeds that become plants, caterpillars, butterflies, tadpoles, frogs and babies, birth and becoming adults. Particularly suitable to teach and perform as part of a cross-curricular or CLIL project about nature. A complete teaching actions video. Quickly learn the song and its actions before teaching it to your classes. Two MP3 files of Nature’s Plan – the original Charles Goodger voice and and the music-only, karaoke version for performances and events. Lyric sheet with guitar chords. Set of 5 graded PDF worksheets to rework the content of the song. You can photocopy or project them on a LIM. Teacher’s Notes and Lesson Plans: suggestions and ideas on how to use the FunSongs Method and the graded worksheets. Words related to growth and transformation in the natural world: seed, plant, caterpillar, butterfly, butterflies, tadpole, frog, baby, man, nature. This is a great song to use in a cross-curricular or CLIL project. Nature’s Plan – watch part of the teaching actions video. Access the full version when you download the package.